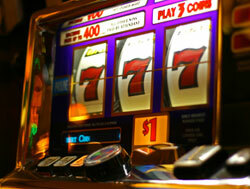 The first Slot Machine was produced in 1895. It is considered that the inventor of slot machines was Charles Fey (1862-1944). His first slot machine was called the Liberty Bell. It was the beginning of slots machines industry development. There were three spinning reels in the Liberty Bell. If you are interested in this slot machine you can visit the Liberty Belle Saloon and restaurant in Reno, Nevada. Ironically, but the first Slot Machines didn't give great cash! The players could get only 50 cent payout, some drinks; frequently the gambler could win cigars. Of course the Liberty Bell had a bell which made a special signal when the player hit the winning slip. Usually these slot machines were located in different bars and pubs. In 1910 were presented some changes to the Liberty Bell by the Mills Novelty Company. The Mills Novelty Company presented some changes to the Liberty Bell in 1910.New innovation was called the Operator Bell. In that slot machine creators introduced better neck coin input and today's favorite fruit symbols (cherry, plum). The quantity of those slot machines was nearly 30,000. Their weight was really great, nearly 100 pounds. In the long run, the epoch of cast iron slot machines came to the end. The new type of slot machines were introduced in 1915. Those were propounded by the Mills Novelty Company and were much easier and cheaper. The main material which was used in those slots machines was wood. The first thing that was changed in slot machines was the noise which became unendurable while playing the game. That is why the creators corrected this problem. The following thing that the Mills Novelty Company introduced was a double jackpot that means that the players could gain more in quick perpetuity. Taking into consideration, that slot machines became more and more popular at that time, the activities of Mills Novelty Company increased. As a result of that process the world saw new, interesting and exiting slot machines. A lot of new colorful, bright slots based on their own scheme were introduced in early 1930`s. So, you see that the history of slot machines is very eventful and interesting. You have learned about companies and people who increased the popularity of slot industry. Undoubtedly, this kind of gambling can diversify your weekdays.